Behavior tables are a design formalization intended to support interactive design derivation for hardware and embedded systems. It is a reformulation of the DDD transformation system, bridging behavioral and architectural forms of expression. The tabular representations aid in visualizing design aspects that are subject to interactive refinement and optimization. These ideas are illustrated for system factorization, an import class of decompositions used in design derivation. A series of examples shows how features seen in the behavior tables determine the course of a factorization and how the rules of a core behavior table algebra compose into the more large scale transformations done at the interactive level. This research is supported, in part, by the National Science Foundation under Grant MIP9610358. Bhaskar Bose. DDD-FM9001: Derivation of a Verified Microprocessor. PhD thesis, Computer Science Department, Indiana University, USA, 1994. Technical Report No. 456, 155 pages, ftp://ftp.cs.indiana.edu/pub/techreports/TR456.ps.Z. Steven D. Johnson. A tabular language for system design. In C. Michael Holloway and Kelly J. Hayhurst, editors, Lfm97: Fourth NASA Langley For-mal Methods Workshop, September 1997. NASA Conference Publication 3356, http://atb-www.larc.nasa.gov/Lfm97/. Steven D. Johnson and Alex Tsow. Algebra of behavior tables. In C. M. Holloway, editor, Lfm2000. Langley Formal Methods Group, NASA, 2000. 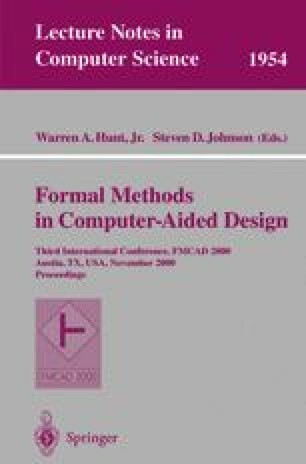 Proceedings of the 5th NASA Langley Formal Methods Workshop, Williamsburg, Virginia, 13–15 June, 2000, http://shemesh.larc.nasa.gov/fm/Lfm2000/.